How to re-edit exported flip book from output folder? We can use flip software to create flip publication in a short time. However, it is hard to avoid some mistakes so that we need to re-edit the book. Or we simply want to upgrade the flipping book to be more professional. Is it possible to import a created flip book from its output folder? The answer is yes. In the latest version 1.3.5, a new feature is updated into the software to realize this function. 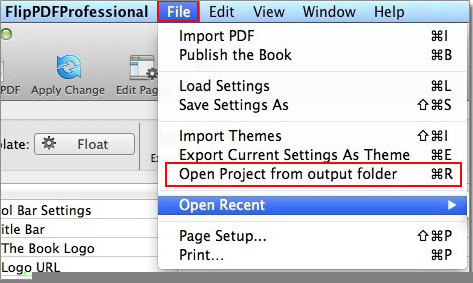 Click “File” in the top menu -> Click “Open Project from output folder”, find the output directly to import the page flipping book you have exported before. In this way, an entire project including PDF file, all template settings and embedded objects will be imported successfully.